Last week's party was pretty slow because there was this small little holiday called CHRISTMAS on the same day :) And I'm guessing this weeks party will be pretty slow as well since most of you are probably out celebrating the new year! Even though there were not many link-ups, last week there were some fabulous ladies who shared their fabulous styles, and here were three of my favorites! I hope you had a great Christmas Rebecca and thank you for hosting such a great link party every week. I do look forward to it! Thanks for featuring me!!! :) Love this link up! 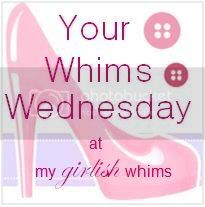 I love how creative you are with your posts and I always look forward to you're 'weekly whims' keep doing what you are doing as I thoroughly enjoy your blog. This post is incredibly good, I love the content of your writing. You have helped me to pluck up the courage to start up my own blog as I have always wanted to create one but I've just been too shy to do so., part of me feels like I should stop blogging because of I haven't been noticed and I feel like my posts are just floating there with no one looking at them and giving me feedback, however I am always reassured when I see you've posted another blog post and it gives me the confidence to keep at it as I know no matter what at least I enjoy what I am writing about and hopefully others will to someday.